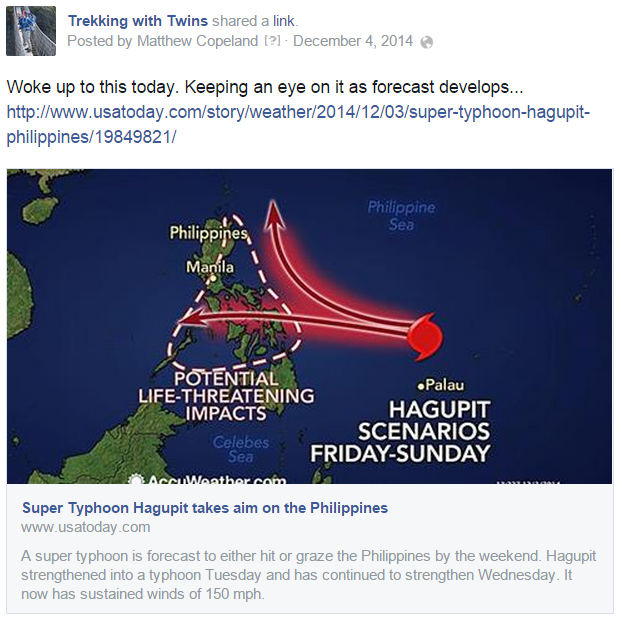 This was our Facebook post the morning we learned of Typhoon Ruby. We awoke to a Facebook message from a family friend who lives in Manila. A “super typhoon” was approaching the Philippines. When I opened my laptop and checked my email I saw a message from my father, a meteorologist, with a similar warning and a promise for updates as the situation developed. We started scouring the internet for information and it was hard to come by at first. The Philippines national weather service website (PAGASA) was down. The news that was available was ominous but imprecise. Basically the bottom line was a giant typhoon was bearing down on the Philippines and it had potential to be as bad as last year’s Yolanda – i.e. catastrophic. Sufficiently freaked out that we’d just flown ourselves into the path of imminent danger we began looking for options. Problem was, we didn’t know where to go. The typhoon was still a few days away from making landfall and the predicted paths ranged from directly over Boracay to turning north towards Japan and avoiding the Philippines altogether. We pretty quickly decided that our little native style bamboo hut was not the best place for us to be when a major typhoon came through, so we ruled out staying put. We considered staying in Boracay but moving to a more substantial hotel at higher elevation further from the beach. Our main problem with that was we didn’t like the idea of being trapped on a tiny island with minimal infrastructure if a storm caused major flooding, power outages, and other damage. We also were concerned about how to get off the island if we needed to later. There’s no airport so you’re reliant on the bancas to get you back to Panay. We already had a flight booked to Cebu City as part of our plan to go to Bohol (fly to Cebu then take a ferry to Bohol). The flight happened to be scheduled about 2 days before Ruby was predicted to impact the area. Though, at the time, Cebu appeared to be slightly more in the path of the storm than Boracay, we liked the idea of a major city with big modern hotel buildings. So we decided that we would still fly to Cebu, but instead of continuing on to Bohol we would ride out the storm in the city. Cebu City is the second largest city in the Philippines and is a major metropolis. Arriving from the airport we felt very comfortable with our decision as we saw many high rise hotels under construction that looked to be solidly built concrete structures. We had searched out a suitable hotel for ourselves on Agoda, looking primarily for a modern high rise at least a little ways from the water. We found the filters and map features on Agoda really useful for this search, as we could narrow down to places in a certain area, for the right price, with a pool (critical). We were looking for a reasonable price of course, but had to adjust our expectation in light of the impending “super typhoon” and city location. We were willing to pay more than our typical accommodation budget for a place that we felt was very safe. In the end we settled on Quest Hotel which is in the business district near Ayala Mall. Quest turned out to be the perfect home for us for the few days we were there. Walking into the Quest Hotel lobby was actually quite jarring for us, having just come from a rustic all-bamboo Boracay beach resort. Quest is a modern luxury hotel and the lobby was full of lights, Christmas decorations, and uniformed staff attending to all of our needs. Our room was small but very nicely appointed. We were in awe of the big bright bathroom with lovely rain-like shower. We felt like the cast from Lost reintroduced to modern society after cleaning off and putting on some fresh clothes. Quest Hotel has a pool on the 7th floor overlooking the city. We couldn’t use it for most of our stay because of maintenance and the storm, but when we finally got the chance on our last day we really enjoyed it. It was a little chilly but the views were great and the kids loved splashing around. 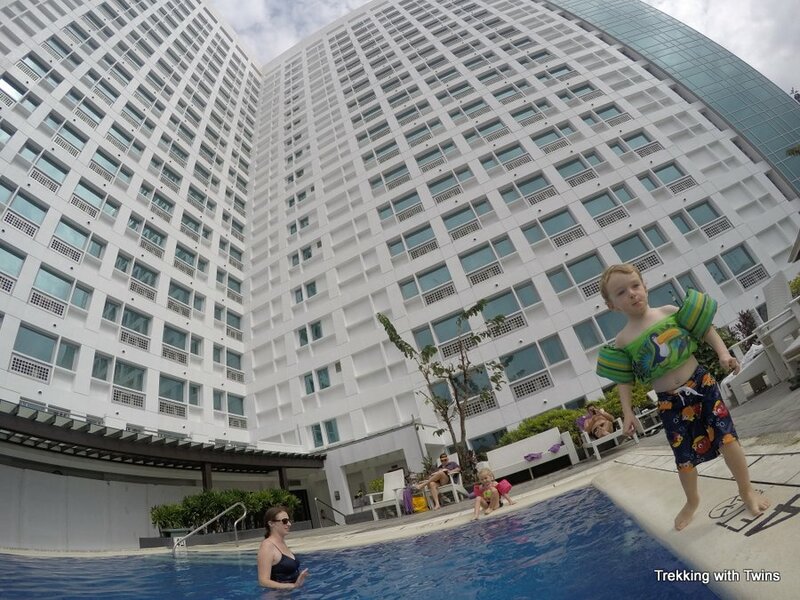 Enjoying the pool on our one sunny day in Cebu. 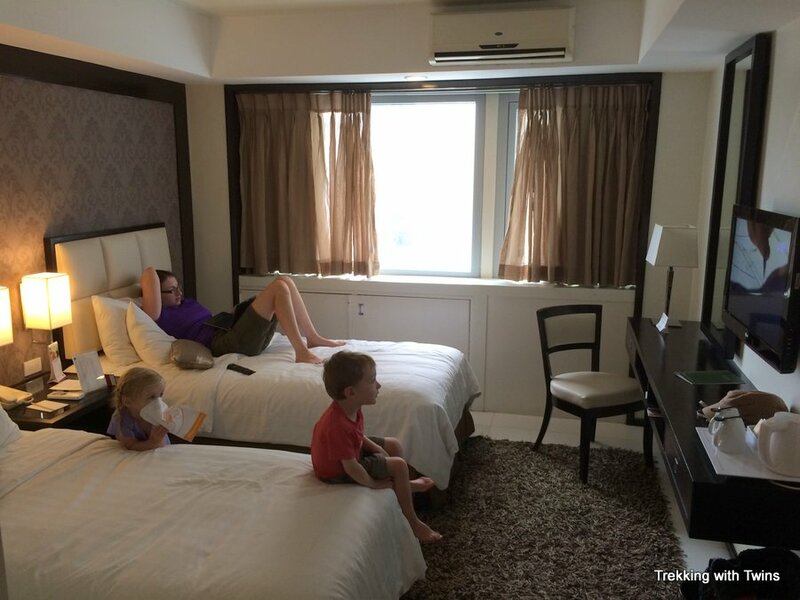 The best part about our choice of Quest Hotel was that it is located very close to the Ayala Mall. 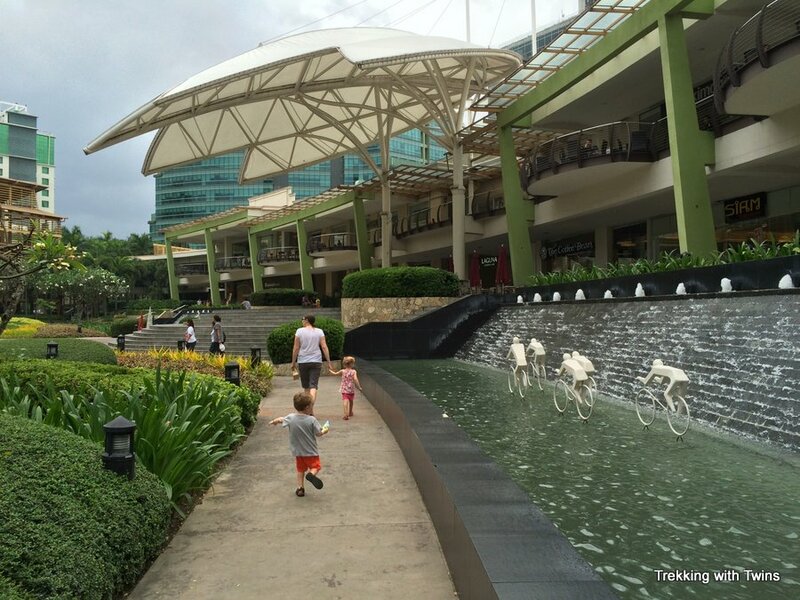 While we wouldn’t normally seek out a mega mall for entertainment, it worked out perfectly for the few rainy and windy days thanks to Typhoon Ruby. We saw only a little of Cebu during our brief time there, but we really enjoyed both activities we sought out: the Ayala Mall and Cebu Taoist Temple. Ayala Mall is enormous. We had not yet experienced other Asian malls, or even any of the mega malls in the US, so we don’t know where it fits compared to other giant malls. But in any case it’s really big. When we first walked in we were nearly run over by a 5 year old driving a little bus with blinking neon lights and blaring some kind of 80’s video game style music. We knew we had to get in on this fun. We came to find out that there’s a whole fleet of these things, including two larger ones that look like giraffes. 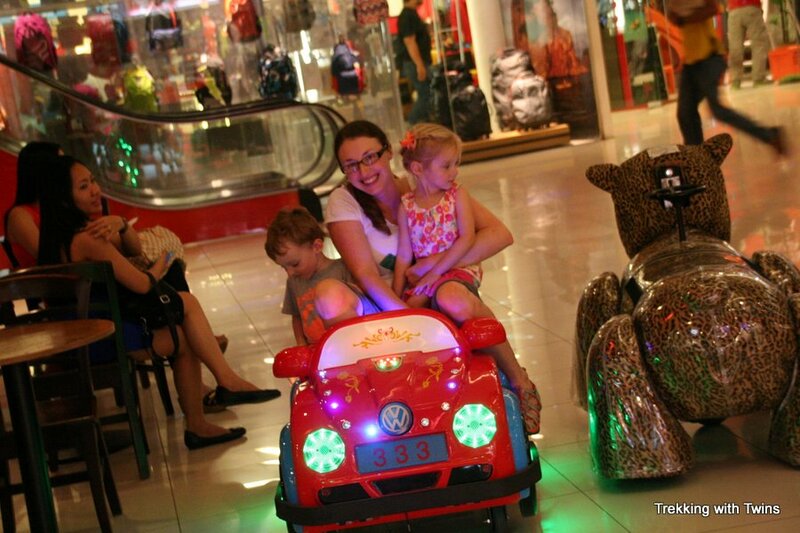 You can rent them for a few minutes 5 or 10 pesos and your kids can drive them around. 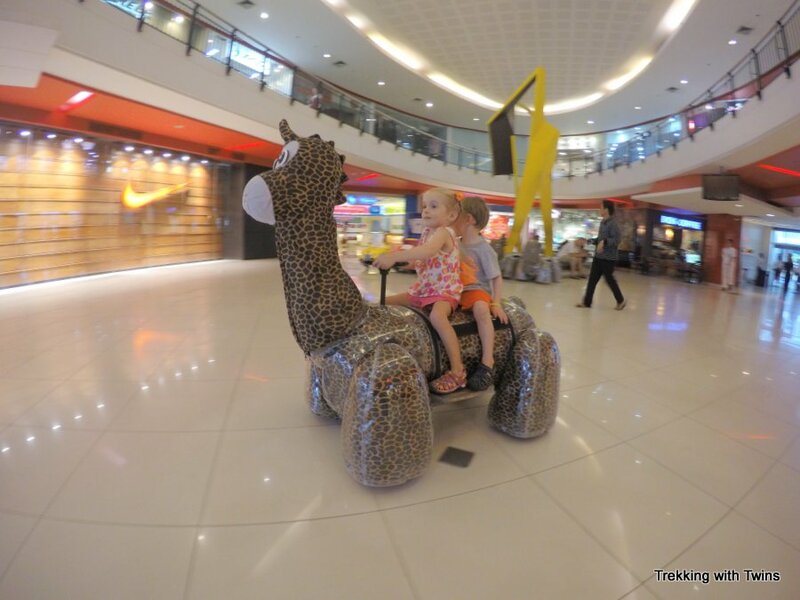 There’s no designated area – they just dodge in and out of the pedestrian traffic – but they’re super fun and the twins pretty much refused to enter or leave the mall without going for a ride. After getting past the little cars there’s a giant arcade as well. You pay for the games with a preloaded debit card that you pick up at the prize redemption desk. You can load it with whatever amount you want, subject to some minimum (maybe 50 or 100 pesos). We put 100 pesos on and got at least an hour of games out of it for the two kids. On the bottom level of the mall there’s a small playground with a rock climbing wall, slide, see-saw and some other climbing structures. 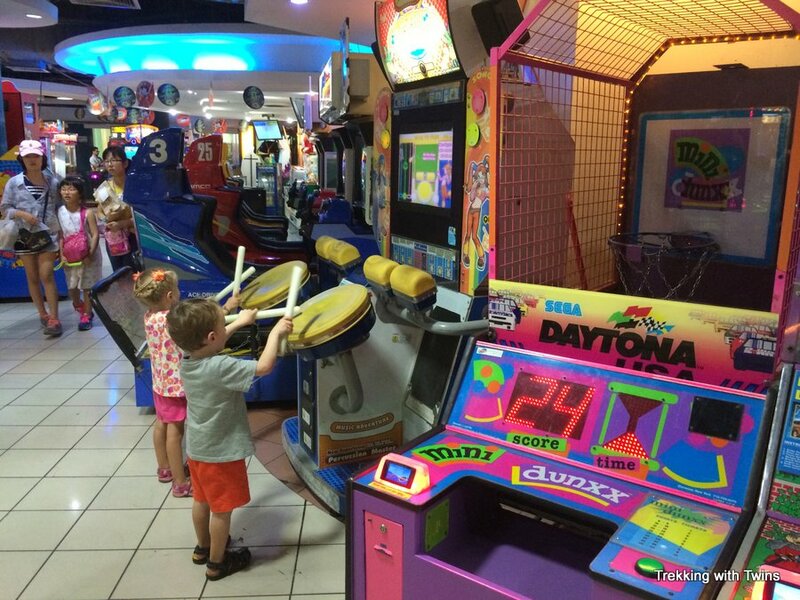 We hit this up several times as it was about the only way for the kids to burn off energy as we were stuck inside most of the time due to the weather. 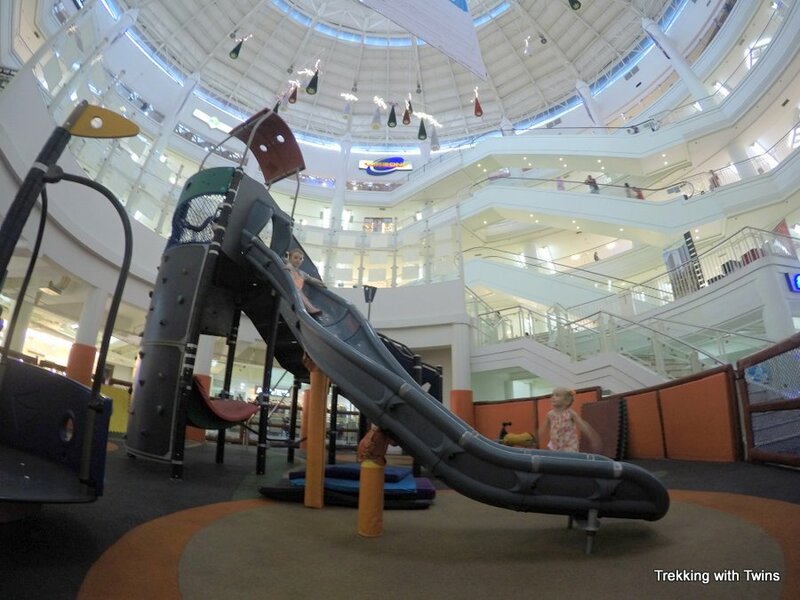 An indoor playground!? Could you ask for more during a super typhoon? There’s also a large Lego play area in the middle of one of the mall’s many walkways. There are some Lego’s for sale here, but mostly it has play tables with big buckets of mixed Lego’s in the center. Adjacent to the mall is an annex area called The Terraces. The Terraces is a multilevel outdoor mall filled primarily with restaurants. We ate most of our meals here (see below). One night there was a huge outdoor Zumba dance class. We stopped and watched for a while, not quite sure what to make of the spectacle. But the twins (and Kat!) were pretty excited about the music and eventually couldn’t resist joining in the dancing themselves. Great free entertainment! Typhoon Ruby turned out to be pretty mild in Cebu City and we didn’t see much more than light winds and rain. We felt very lucky to have avoided the brunt of the storm. While Boracay also had only minimal effects from the typhoon we are still glad we decided to play it safe. On our last full day in Cebu the weather was nice so we decided to venture out to the Taoist Temple. 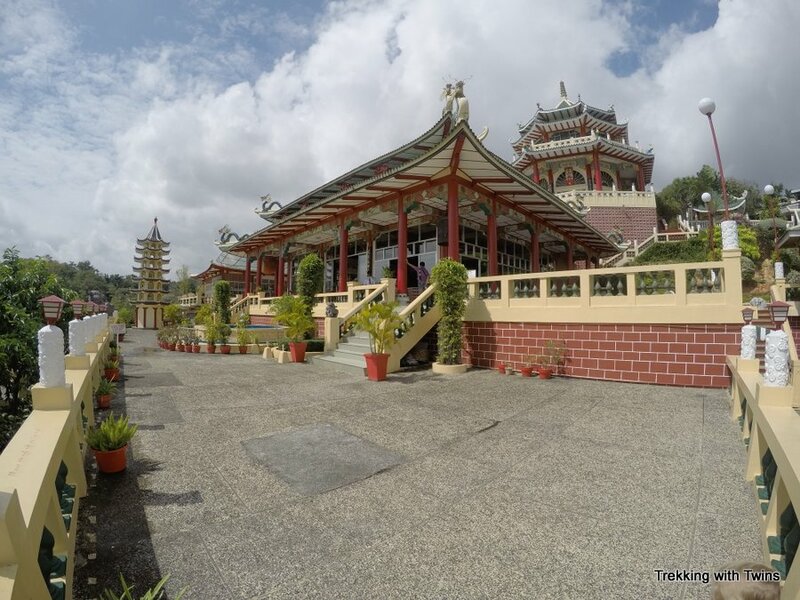 The Taoist Temple is in the fashionable Beverly Hills neighborhood of Cebu City and is well worth a visit. We wanted to get a taxi driver to bring us to the temple, let us look around for an hour, and then drive us back to the hotel. When I asked the first driver how much it would cost he said 1,500 pesos. The hotel concierge offered to have hotel staff do it for 1,800 in a hotel vehicle. We had read that it should not be more than 500 so trying a different approach I went to another driver and asked if he would do it for 500 pesos (instead of asking “how much”). Without further negotiation he said yes and we were off. As it turned out the temple was not far from the hotel at all, and the ride was less than 10 minutes. There’s no entry fee when you arrive either so the all-in price for the activity was just 500 pesos. The temple and its grounds are beautiful. The buildings are full of color and adorned with impressive dragons sculptures. Climbing the steps through the gardens to the various temple buildings revealed new vistas at each turn. Some reviewers online had complained about the climb, but it wasn’t bad at all and we had no problem. The view back over the city from the upper levels is certainly worth the effort. Enjoying the view back towards Cebu City. Make sure you find the “Great Wall” replica near the top of the temple and take in the view looking back up from there. It’s perfectly arranged, with a giant dragon sculpture and vibrant gardens in the foreground and the temple in the background. While our taxi driver didn’t wait for us he did return precisely one hour after dropping us off and brought us back without a problem. 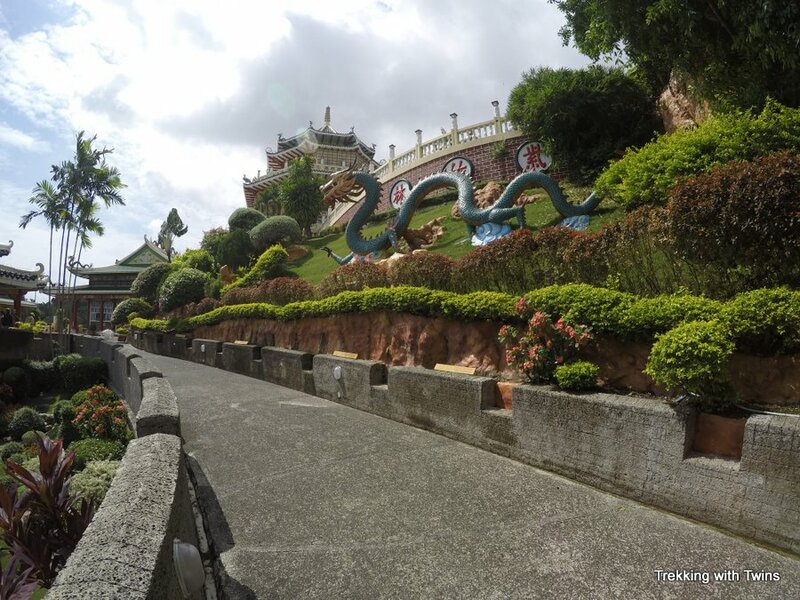 Definitely make time to visit the Taoist Temple if you find yourself in Cebu City. It’s a great activity that takes just a couple hours and we really enjoyed it. We ate just about all of our meals at either The Terraces or Ayala Mall. The only exceptions were a couple of meals that we scrounged together in our room from crackers, fruit, and nuts that we bought at a grocery store (at Ayala Mall) and a breakfast of donuts from Krispey Creme (at The Terraces). The mall and Terraces were just too convenient with too many choices for us to journey elsewhere in the rain. Perhaps we should have been more adventurous but we were very happy with the options right next door. 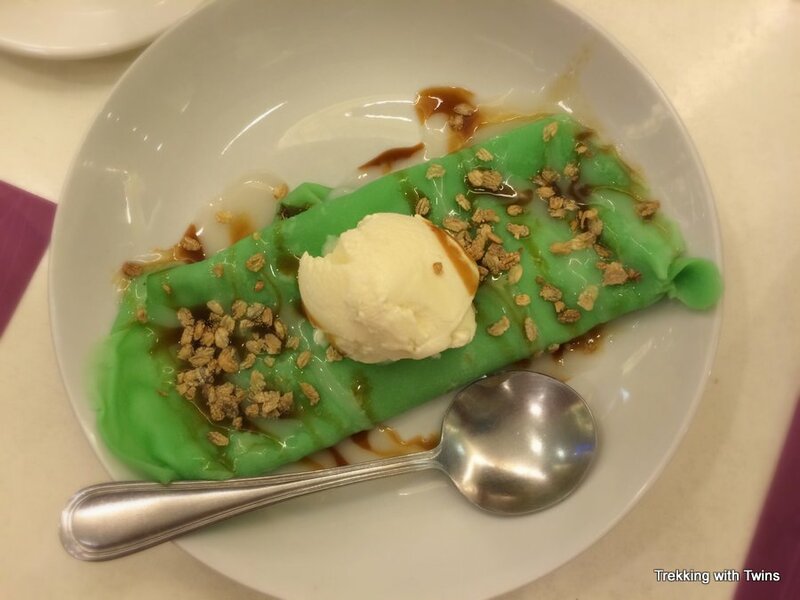 We tried a bunch of places but our favorite was Lemon Grass at the Terraces. Lemon Grass had a variety of Vietnamese and Thai dishes, as well as super refreshing herb lemonade. Perhaps better described as lemon water, this concoction came in a pitcher filled with fruit and vegetable garnish that the kids devoured as fast as we drank the lemonade. Funny and delicious. Great desserts too. We tried a Japanese place, SumoSam, that had good sushi and noodles (The Terraces). Army Navy in the mall food court hit the spot for lunch one day with awesome, reasonably priced burritos, and contributed to that being our only on-budget day in Cebu City. We also even tried TGI Fridays for one lunch and it was basically identical to one in the US, including the price. We commented to the staff that while cheap in the US, it was quite expensive for the Philippines, and a waitress said it was one of the most expensive restaurants in Cebu City! There’s good ice cream for an amazingly cheap 20 pesos up on the 5th floor of the mall by the movie theater (about the only thing that was cheap in Cebu). Overall we liked Cebu City, though we didn’t see a whole lot of it. 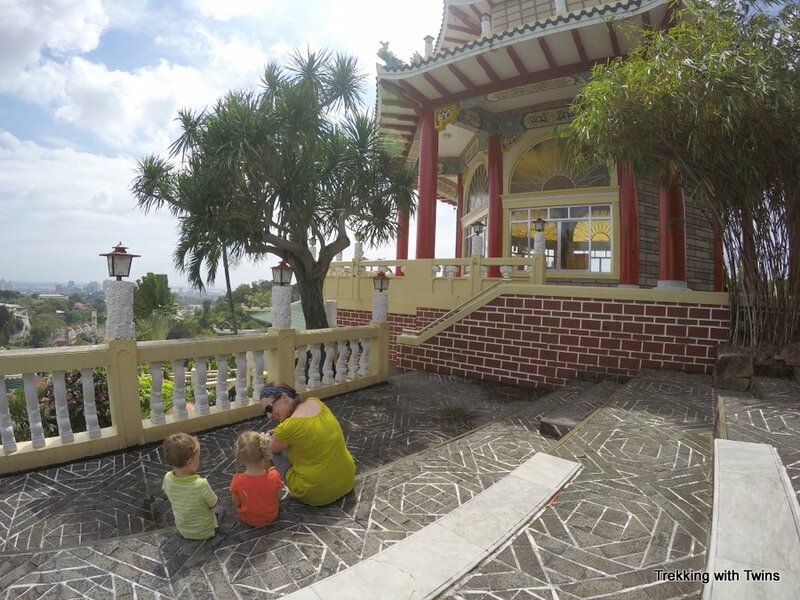 We didn’t intend to stop their at all so in some ways Typhoon Ruby exposed us to some cool new stuff that we wouldn’t have seen otherwise, like the Taoist Temple. Plus, would life be complete without enjoying these crazy cars in the mall? 1) the architecture of that mall is amazing! I thought the US was “the land of the shopping mall”, but apparently they’re everywhere! I can’t get over how westernized everywhere you’re been seems to be… just like home, almost. 2) Why is it that when the temple was built (I assume it’s old), the most magnificent buildings were places of worship, when today the most extravagant buildings are stores or offices? Enjoy… looking forward to the next time. Hi Paul, thanks for reading and for your thoughtful comments. Boracay and Cebu were the two most “developed” places we stopped in the Philippines besides Manila. Other areas, and even many parts of those 3, are quite different. The Philippines has a huge range of traditional to modern and we loved all of it. Of course people are still people everywhere, and we’ve felt welcomed everywhere we’ve been. Let’s hope, eh? Try to visit an ancient temple somewhere. Do you think it is worth stopping over in Cebu on the way to Bohol even if there isn’t a storm? To be honest we didn’t see a whole lot of Cebu because of the storm. We liked what we saw and had a good time, but we probably would have preferred to have more days to explore Bohol. Thanks for writing! We would love to see other parts of the Philippines. Months later your country still holds a very special place in our hearts. What a special place!